It occurred to me in Church yesterday that everything I was experiencing in the liturgy was according to gender. I worship as a female…and over and over in the liturgy I am reminded that it is precisely because of gender that I am saved. Creation is something that we must receive as reality. A Christian’s world is not what he/she makes it. Creation is gift, given to us and we must receive it. A Christian’s response to this gift is to commune with the world through role playing. I have a part to play, a role I was given by the Director Himself. Everything in creation has an identity and role to play. Roles are derived from identity. The role of a tree is that of a tree, because it is a tree. A tree cannot sing, even if we imagine the beautiful rustling of leaves to be a choir. When it comes to the male and female persons we again see the duality of these realities. Males and females have form…identification…and they do things…role playing. The modern view of gender is concerned mostly with parts and totally disregards what men and women do…denying that men and women were created to do different things. The classic Christian qualifier of womanhood has everything to do with the womb. In regards to males it also speaks deeply of a man’s ability to produce offspring through seed. Seed and womb…He created them male and female. What has replaced the received creation of male and female is a world of our own making. However, this remaking of the world will fail…for only in the true image are we created, we cannot be something “other”. We are not God, we are His creation. My name day was Saturday, and as I pondered the icon of Joachim and Anna at the golden gate I grieved for a world that is void of such images. I shudder at the images of the world. I cling to the Image of God in the icon. 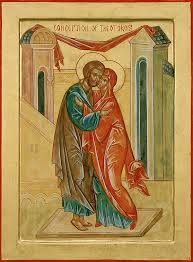 In the embrace of Joachim and Anna lies the ancestral heart of Christianity, as if every begat is made present in that one embrace. Man and woman, embracing, conceiving, begetting. Seed and womb, glorifying God. All those begats in the Scriptures, the lists we say are boring, that we like to skip over, they are the real story, the real story of man, the reality of our salvation. Christian marriage is the embrace of man and woman, the embrace that begets, and when it doesn’t we hurt, we cry out, we suffer. We are the Ancestors of God. What a wonderful post – I love the picture of Joachim and Anna that you present, and the phrase, “the embrace that begets” is so rich and overflowing, as you note, symbolizing all the begats and the story of our salvation. Glory to God!